Pixel Dan is back with a new review. 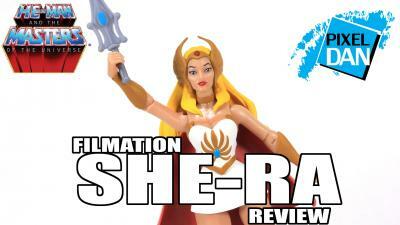 This time he takes a look at the Wave 3 MOTU Classics Club Grayskull She-Ra from Super7! Check it out below and click here to join the discussion on the He-Man.Org forums! Pixel Dan is back with a new review. This time he takes a look at the Wave 3 MOTU Classics Club Grayskull Mantenna from Super7! Check it out below and click here to join the discussion on the He-Man.Org forums! Pixel Dan is back with a new review. This time he takes a look at the Wave 3 MOTU Classics Club Grayskull Grizzlor from Super7! Check it out below and click here to join the discussion on the He-Man.Org forums! "Hey everyone. We have SiMo Sol's "Skeletor - The Eye Of Evil" available for purchase now on the site! This will be our last SiMo piece for 2019 and is limited to 200 numbered pieces worldwide! Don't forget to take advantage of our no-interest custom payment plans if that appeals to you!" And click here to join the discussion on the He-Man.Org forums. She-Ra and the Princesses of Power is one of several new licenses that Rubie's Costume Company have acquired for 2019! Their catalog and website show a couple of products for children that are planned for release later this year. There is also an adult She-Ra costume listed on their website, although there is no image for it yet. For folks who are interested in buying their costumes and/or accessories in-person: Contact your local retailers to find out if they will be carrying these products. Click here to view all the She-Ra and the Princesses of Power products on Rubie's website! Click here for the She-Ra children's costume on BuyCostumes.com! Click here for the Catra children's costume on BuyCostumes.com! Here is the next MOTUC Collector's Choice bio reveal: Vanishing Orko! Are you hungry for Episode 157 of He-Man.org's Roast Gooble Dinner? Val Staples, Danielle Gelehrter, Rob Base and Daniel Benedict are back to discuss He-Man and She-Ra. Also, don't forget the Roast Gooble Dinner iPhone App, which is great for organizing and downloading current and past episodes. Click here to get yours today! And if you have a comment or a question, please call us at (310) 933-5993 or at our Skype account "roastgooble" and leave a voicemail (in Skype, please go to Call Phones and enter roastgooble as the phone number and dial in. Please do not add roastgooble to your contact list as we won't accept the request. Sorry!) We'll try to work your voicemail into the show, so please call! Otherwise, you can e-mail us at gooble (at) he-man (dot) org. One or more of the hosts will read your e-mail on the show. Please keep e-mails short and sweet! So pull up your chair and fill up your plate! It's time to chow down on a tasty serving of fandom here on He-Man.org's Roast Gooble Dinner! "Come April 10th, players of Drive Ahead! will be treated to a free five-week game event, featuring new and exclusive Skeletor-themed Hot Wheels rides, as well as an epic helmet modeled after the infamous antagonist himself, available for a limited time only. Getting to these event prizes will be no easy feat, as players must battle not only Skeletor, but other menacing creatures hailing from Snake Mountain and its surroundings. Working with Mattel and Hot Wheels has allowed us to really double down on the collectible nature of the Drive Ahead! cars, with new vehicles with real-life Hot Wheels counterparts being introduced weekly. The positive fan feedback has surpassed even our greatest expectations, and with this kind of reception, it's hard to even imagine what the introduction of an iconic character like Skeletor will look like. It's safe to say we’re expecting to break records. Skeletor's Revenge will mark the sixth and final episode of the Hot Wheels Wednesdays series of in-game events, a collaboration between Mattel's classic toy car brand, Hot Wheels, and Drive Ahead! As part of the 50th anniversary year of Hot Wheels, the partnership has introduced Drive Ahead! players to classic Hot Wheels baddies like spiders, gorillas and sharks, while enabling them to unlock and collect digital versions of actual Hot Wheels rides. This final episode presents the loyal protectors of Hot Wheels City with a threat of unprecedented scale, in an in-game representation of Skeletor from the classic Masters of the Universe toy series. So what are you waiting for? Go! Play! Now!" And, Skeletor is voiced by Joe Ferencz! Joe is no stranger to MOTU. He is a former Franchise Business Development Manager at Mattel and is currently a gaming business consultant at Mattel, which helps make Skeletor's Revenge even more special. Be sure to check it out! Here is the next MOTUC Collector's Choice bio reveal: Battle Armor Sy-Klone! Non-Attendee pre-sales are now live from BigBadToyStore and SPACE Figuren for the Power-Con 2019 exclusives, while supplies last! Click here for info and links. The Fans of Power podcast, featuring Joe Amato, Tyler Baker, and Nathan Kennedy, is back with episode 176! TThis week they are joined by Val Staples, Power-Con Event Director, to discuss the upcoming Power-Con and a multitude of MOTU topics including the new movie, 200x, and more. Are you hungry for Episode 156 of He-Man.org's Roast Gooble Dinner? Val Staples, Danielle Gelehrter, Nate Baertsch, Rob Base and Daniel Benedict are back to discuss He-Man and She-Ra. Super7 has once again provided answers to your questions. Check out their answers to your Round 17 questions! This round of questions were selected by melkor23. Thanks to that fan for their help! 1. melkor23: Did you consider crowd-funding to help produce obscure characters in Collector's Choice? You could use the most popular characters from the He-Man.Org fan polls as your base goal and more obscure characters as stretch goals. We have avoided the crowdfunding route so far, simply because it seems more an appropriate platform for newer creators, as opposed to an established company. Our intent is to create the figures we feel good about and feel an audience will be interested in, and commit internally to making them or not. 2. Niki: Would you give us an exact list of what will be included with Snake Mountain? Such as the bone throne, scrying table, ladder, tentacles, etc. Yes, we will be making a full announcement in mid- April as we get closer to the pre-order with all the parts and features, dimensions, pricing, etc. 3. zodak74: Would you provide us the dimensions for Snake Mountain ahead of the pre-order? Knowing the height, width, and length info would help those of us who are planning where to display this piece. 4. MikeR601: Do the terms of your deal that lead to the William Stout Collection allow you to release other characters in their movie decos, such as Evil-Lyn, Man-At-Arms, and more? Currently we have arranged for the four figures of this wave only. 5. WalkerBoh: It has been theorized that the William Stout collection is the last attempt to keep the Collector's Choice line alive. If this pre-order wave does not meet your sales goals, will Collector's Choice continue? While the Collector's Choice line has certainly run a long time and covered the majority of characters in the MOTU Universe, the William Stout collection was more an effort to create figures of some of the most often requested characters in a way that works for everyone. Our follow up to this wave is the Collector's Choice Snake Mountain playset. Beyond that, who knows?! Check out what fans have to say about the answers to the WTFWTK 3.17, as well as find links to all the previous Fan Q&A sessions! "PRE-ORDER OPEN NOW: The Super7 Masters of the Universe Collector's Choice series continues with the William Stout Collection of highly detailed deluxe 7-inch figures. Based on the legendary 1987 William Stout production art, each highly articulated figure was sculpted by the Four Horsemen and comes complete with accessories. The set includes He-Man, Hyper Skeletor, Karg, and Skeletor. The Masters of the Universe William Stout Collection set of 4 figures is a made-to-order release for $140 per set (plus shipping) and individual figures are available for $35 each with a full set. This pre-order is open until March 31, 2019 with shipping in Summer 2019. These pre-orders are open until March 31, 2019." And, click here to join the discussion on the He-Man.Org forums!